Today’s guest is a personal friend of mine and one of the most genuine people I’ve ever had the honor of knowing. I’m beyond excited to have Sheridan Gregory from SheridanGregory.com on the podcast today! She’s a mama to two beautiful little boys and a blogger who explores fashion, lifestyle, travel, and beauty on her site - among real-life tidbits that make her authenticity shine. From motherhood moments to video tutorials that make you fall a little bit in love with the girl, Sheridan brings personality and light to her content - no matter the medium. And today, she’s unloading honest answers when it comes to algorithm changes, where she sees the industry going, and how to balance it all. 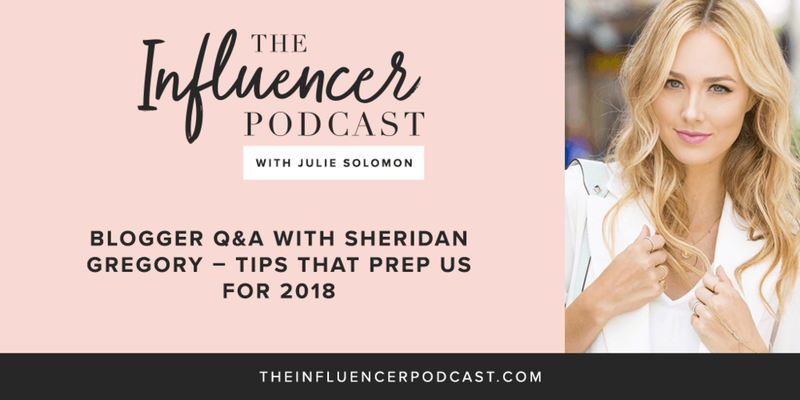 Featured on sites like PopSugar and TeenVogue, and working alongside major brands like H&M and Covergirl, Sheridan’s charming wisdom is something that’ll leave you feeling motivated and positive moving into 2018. I love her raw approach to keeping things real in the name of engaging content, and how she truly believes there is space for all in the influencer world - and how to stand out. Because I couldn’t agree more! Algorithms are out of our hands and will be forever changing. Instead of butting heads in frustration, accept what you're in control of and learn to engage with your amazing community. Since the market is saturated, it’s important to show your unique self so that people can connect and feel invested in your life. Don’t be afraid to show the authentic you! Consider exploring video content as a goal for 2018.